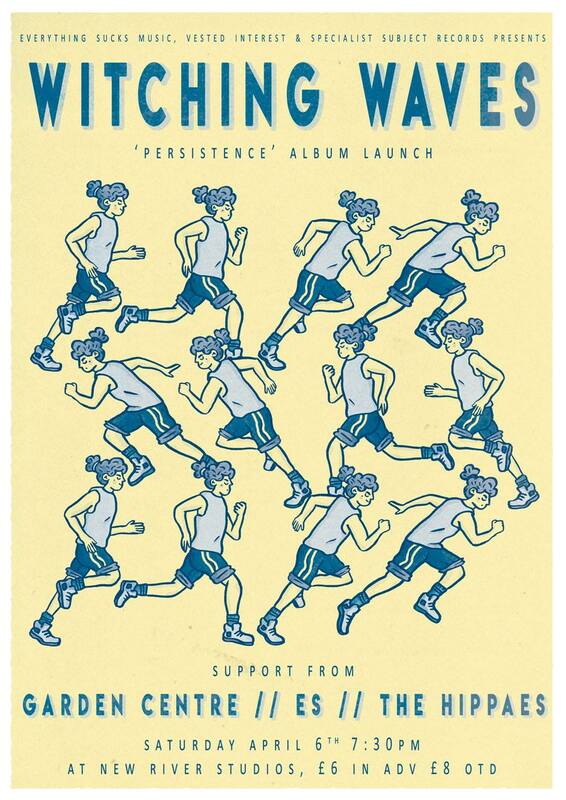 A celebration of the brand new Witching Waves record Persistence which will be out on 5th April via Specialist Subject Records. To celebrate the release WW are having a London launch party with friends, Garden Centre, Es and The Hippaes! Witching Waves formed in 2013 as a way for them to cover songs and for Emma Wigham to learn drums. Instead of keeping it to themselves they decided to learn in front of people and to record everything they did at Sound Savers, a recording studio run by the band’s guitarist Mark Jasper. They said yes to every gig, and most of the gigs were at the much missed Power Lunches. They released their first EP on Suplex Records before releasing a full length album Fear Of Falling Down in 2014 on Soft Power. This was quickly followed by a ton of touring and the release of another album Crystal Cafe in February 2016, this time also on American label HHBTM. Estella Adeyeri joined the band in 2016 on bass, and as a band they continued writing, recording and touring. The result of the last three years work is their new LP Persistence, an energetic and thrilling ode to mental health problems, big cities and ongoing struggle. There has always been a course vulnerability to Max’s voice, intimate and defiant. As he did under his original moniker King Of Cats, Max uses Garden Centre to continue to explore how his narratives move through increasingly unusual arrangements. Sometimes there will be pastoral sounds and a slow build, you wait eagerly for a climax and it just gently fades away. Other times it will boldly enter with a screaming noise and plunge head first in to a wild stomp. Garden Centre already have two albums out on Faux Discs, but there is also a brilliant new album recorded which will hopefully be released soon. He will be performing with a full band featuring members of Porridge Radio, Ex Void and Keel Her. ES are the soundtrack to your no-wave nightmares, proffering ‘mutant synth-punk for our dystopian present’ (Jes Skolnik). Ethereal synths, tense bass-lines, wired drums and cold vocals collide, proving curiously dark, intense and unrelenting. After releasing their debut ’Object Relations’ 12” EP on La Vida Es Un Mus in 2016, all members now reside in London and are working towards an album in 2019. ES feature members of Public Service, The Worms, Primetime and Scrap Brain. The Hippaes are a new musical project composed of Roo Pescod (Bangers), Hamish Adams (Bangers, Caves, Pale Angels) and Kelly Kemp (Dear Everyone, No Comply). They released an excellent cassette on Keroleen Records in 2016 and now have a new album in the can. They have a sunny approach to indie guitar pop, with a knack for great hooks and guitar solos.